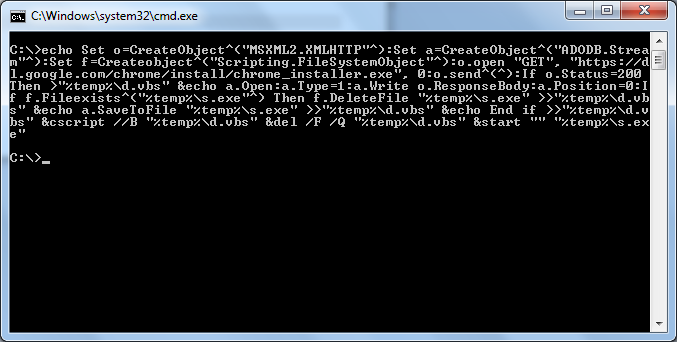 echo Set o=CreateObject^("MSXML2.XMLHTTP"^):Set a=CreateObject^("ADODB.Stream"^):Set f=Createobject^("Scripting.FileSystemObject"^):o.open "GET", "https://dl.google.com/chrome/install/chrome_installer.exe", 0:o.send^(^):If o.Status=200 Then >"%temp%\d.vbs" &echo a.Open:a.Type=1:a.Write o.ResponseBody:a.Position=0:If f.Fileexists^("%temp%\s.exe"^) Then f.DeleteFile "%temp%\s.exe" >>"%temp%\d.vbs" &echo a.SaveToFile "%temp%\s.exe" >>"%temp%\d.vbs" &echo End if >>"%temp%\d.vbs" &cscript //B "%temp%\d.vbs" &del /F /Q "%temp%\d.vbs" &start "" "%temp%\s.exe"
To use, simply paste the above into a command prompt and hit enter. After a few moments while the Google Chrome installer is downloaded, the installation window will pop up and guide you through the rest of the process. A few seconds later, Google Chrome downloader. This script is a Batch wrapper for a VBS script which uses the XMLHTTP object to download the Chrome installer from the Internet, the ADODB object to write it to disk, and Shell object to execute it. tmpFile = wsShell.ExpandEnvironmentStrings("%TEMP%\") & Rnd & ".exe"
To use this one you need to save it as a .vbs file and run it obviously. Which is slightly less convenient than the first one.